“I’ve forgotten such a lot. Most of it, really. Certain things stick of course, although I’ve no idea why. I don’t understand how it works. I read something and then I go across the room to check what’s for dinner and completely forget what I’ve just read. I think, wait a minute, I’ve only just read that: I read it with my eyes wide open, I digested it – and now it’s gone. And then, all of a sudden, things from long, long ago surge up into my mind. Things I can remember in the minutest detail. 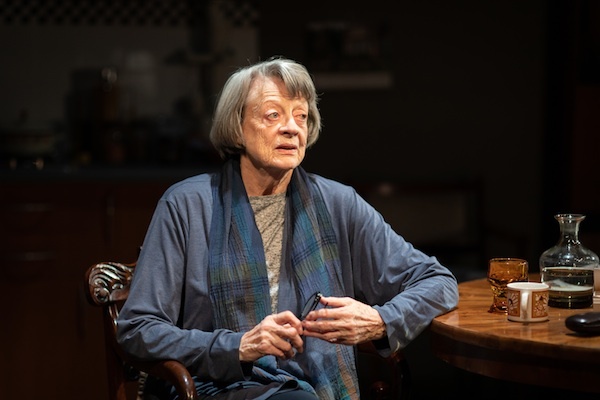 Uneasy laughter ripples through the audience as Dame Maggie Smith performs the opening lines of A German Life, now playing a short season at London’s Bridge Theatre. We have come to be entertained, and Dame Maggie is famed for her pithy delivery, an ability to find the comical in the everyday. But is laughter a justified response here? Does the reaction perhaps hint at something more profound? 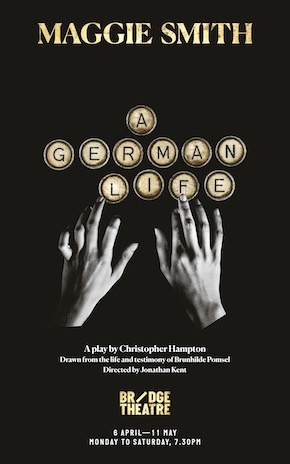 We’ve come to see a play about the selective memories of Brunhilde Pomsel, a secretary to Goebbels in the Nazi regime’s Ministry of Propaganda, and expectations of an unveiling of evil are somewhat thrown by this well-groomed and articulate woman sitting comfortably in her apartment in an old people’s home, inviting us into her confidence. We expect to be appalled by Pomsel’s past actions and decisions – and her racial stereotyping is certainly rather colourful for our PC times – but the delivery is so natural and unforced, so unassumingly reflective, some part of us can’t help but drift to thoughts of how we ourselves might act if, in the wake of a catastrophic economic downturn and an influx of desperate immigrants, opportunistic, populist right-wing leaders were to emerge and turn our political expectations and beliefs on their head. Would we fight back, or go with the flow? Be outraged, or adopt a defensive gallows humour? Drawn from the testimony Pomsel gave to Austrian filmmakers Christian Krönes, Olaf Müller, Roland Schrotthofer and Florian Weigensamer in the documentary film of the same name, and distilled from the 235-page transcript of the conversations they held with her in 2013 when she was 102, Christopher Hampton’s play strikes a delicate balance between candour and concealment, evoking empathy and horror in equal measure. She declares herself “appalled” and “frightened” by Goebbels’ ‘Total War’ speech at the Berlin Sportpalast in 1945, and how the vast, baying crowd “lost their individuality. They were bewitched by this tiny man.” Urged on by the shoulder-tap of an SS Officer, she nonetheless joined in the applause. At an hour and forty minutes, Maggie Smith’s monologue is an extraordinary, engrossing accomplishment, an enticing combination of acute observation and evasive vagueness. Throughout the performance, the table she sits at encroaches incrementally closer and the light behind her dims, reinforcing the penetration of moral and ethical dilemmas past and present into the audience’s heads. With all the late documentation of Pomsel’s recollections, can we yet claim to know the actual level of her complicity in the Nazi regime and the lies it propagated? Or again, whether we or our forebears might have acted differently? 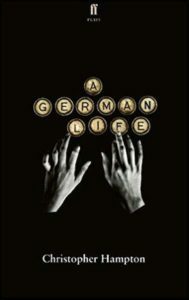 A German Life continues at the Bridge Theatre to 11 May. The run is sold out, but limited £15 tickets are available on the morning of each performance, at the box office in person, limited to one ticket per applicant. Any returns will be announced on the Bridge Theatre website, or available from 6:30 pm at the box office on the day of the performance. Alternatively, you can try your luck in a daily lottery for £20 tickets at todaytix.com. The playscript by Christopher Hampton is published in paperback by Faber & Faber. Mark Reynolds is a freelance editor and writer, and a founding editor of Bookanista.